My friend Dave offered to introduce me to his good buddy Jason who is a wicked good home brewer. 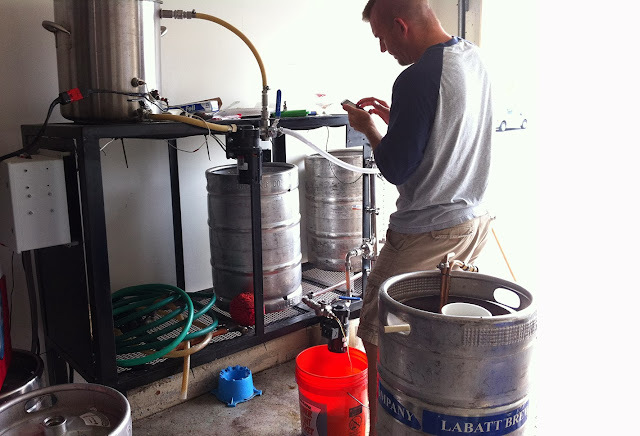 Jason's been brewing for years and turned his garage into a sweet little nano brewery. Equipped with a two tiered brewing system that is temperature controlled by his smart phone and oh yeah, in the back is a fridge with 4 taps. Yes, please... Where do I sign up for this... (including the extra space)? Another awesome tidbit, is that most of Jason's contraptions, he built himself after researching structures and equipment online. Jason does all grain brewing. I have yet to venture to this, but I'm planning in a few weeks to make the jump. I've broken down all grain into these simple steps. Most of my beers I have done some seeping of grains to extract wort, but I've been using extracts too, that are basically condensed wort to expedite the process. All grain is the process that all professional breweries use. In home-brewing it adds about 3-4 hours to the process, which means your brew day could be 7-9 hours. 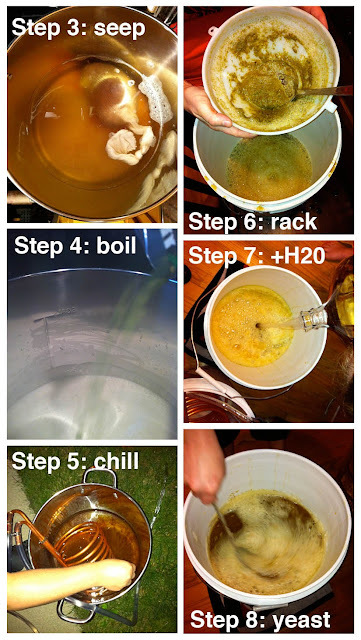 This is probably why the occasional home brewers uses extract, because you could brew a beer in about 4 hours. MASH: The Mash is all your beer's grains. You want to extract the sugars from the grains by adding water and heating them. (Ratio: 1lb of grain 1L of water) Maintain temperature at 148-158 degrees. SPARGE: Sparging is the process of rinsing the off the grains and just extracting the liquid that now has the sugar from the grains. You'll want to collect around 6.5 gallons in the end. The most efficient way to sparge is called continuous sparging. As you are extracting the liquid you're also adding 170 degree water to the top of the grain bed at the same rate. WORT: Wort is what you're left with after sparging.You should have about 6.5 gallons of the sweet liquid. BOIL: Begin to boil your wort (usually for an hour) add hops, spices to make your beer unique. On this brew day Jason was brewing a pumpkin beer and we also helped him with a cider, chopping up the apples for the mash. He told me how easy it was to turn a cider or an apple juice hard. This made me want to experiment with ciders and different flavor combinations since the process was so quick in comparison to brewing time. I will write about my ciders soon. When I took the train out to his place I was reading Zymugry and it happened to be the fall issue on pumpkin beers. Jason had approached his pumpkin beer similarly to the recipe outlined in the magazine. He was brewing an all grain beer and adding the pumpkin puree to the mash with rice hulls to help increase the drainage of the grain bed and prevent everything getting stuck together. Sometimes Jason also reuses his malts from the mash to make bread, he set aside some of the grains from the pumpkin beer for this purpose. One of Jason's friends, Andrew, also came by to help out on brew day too. He brought one of the original bottles of La Folie, to share with us. The three of them had been to New Belgium years ago when they were first starting to make sours and happened to pick up a few bottles while they were there. Sours, like wine, and some other other barrel ages beers, age better with time. 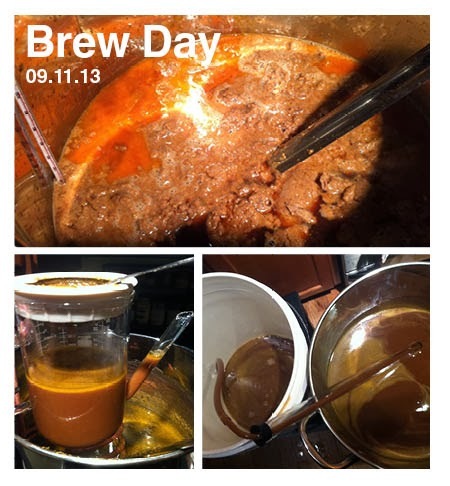 Wow, needless to say it was a super tasty brew day! Hot Squash, is my other pumpkin beer, a savory pumpkin ale. This is my second beer that I brewed with my own unique recipe. Christian, at BrewCamp, helped recommend which malts would go best with this type of ale. My homemade sweet-potato curry mash. I love sweet-potatoes and one of my favorite ways to cook and eat them is mashed. I usually bake sliced sweet-potatoes with a bit of coconut oil and crushed fresh pepper. When they are soft and edges are crisp I puree them in my Cuisinart with sweet and hot curries, yum! 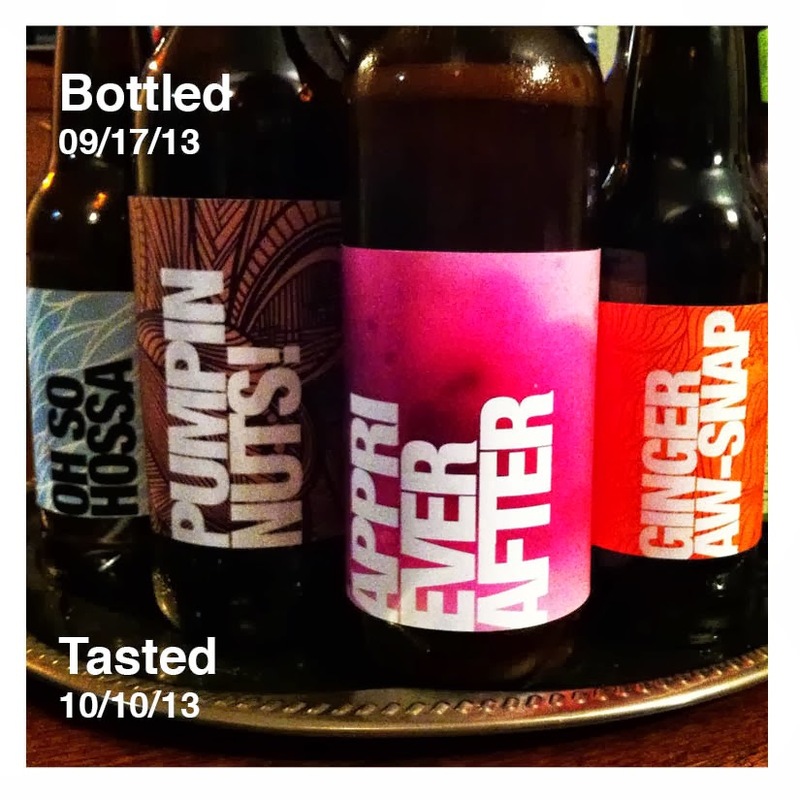 I wanted to take these flavors and translate them into a pumpkin beer. 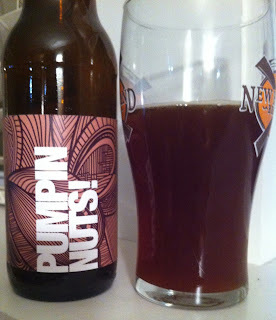 A savory pumpkin beer that isn't too sweet and has some spicy kick. I'm a big fan of spices and I think fresh is the best. One of my favorite spice shops is The Spice House in Old Town. They have a great selection and helpful staff. The majority of my dried spices are from this store. However, I've just discovered another great spice shop that opened earlier this year in my neighborhood, it's called Savory Spice Shop. I'm sure I'll be venturing there soon to spice up some of my winter stouts. After brewing with chunky fruits and oily nuts, this beer was a breeze and made my kitchen smell like a warm and toasty Indian restaurant, yum! I would definitely make this beer again. Final Brew notes: Spicy pumpkin curry give this beer some heat and flavor, it would pair amazing with some Indian food like naan and palak paneer. Cheers to Hossa, who takes home a Silver! The competition was open to Belgian inspired home-brewed beers, in partnership with Vanberg & DeWulf who was celebrating it's Anniversary Coast to Coast Toast! 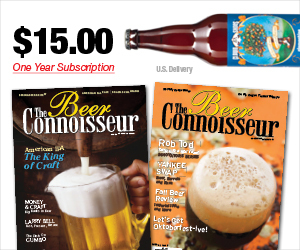 I entered 3 beers of mine, all under the same BJCP category (16E. Belgian Specialty Ale). All of the judges were certified BJCP judges, including one brewer/owner from Chicago's very own Ale Syndicate; The founder of Ommegang Brewery, Don Feinberg, who is also the owner of Vanberg & DeWulf beer import company; along with a few other accomplished award winning home-brewers, including Cesar Marron, who recently just won the 2013 Sam Adams Long Shot Competition. I was able to talk to the judges after and collect their judging notes on my beers to gain insight and feedback from brewing professionals. It was very educational, considering I got into home brewing to create really innovative flavors. I learned when it comes to competitions and categorizing beers, it is very systematic and beers have to have specific characteristics to be able to define it's beer style and gauge it's quality, taste, appearance, aroma, and overall mouth-feel against other beers within it's category. This is how you establish if a beer is good and true to it's beer style. It was a very fun night with friends and the brewing community from all over Chicago. I celebrated, with a tasty Lambickx flight including Oude Beersel Bzart Lambiek, but Kriek was my favorite. Cheers! 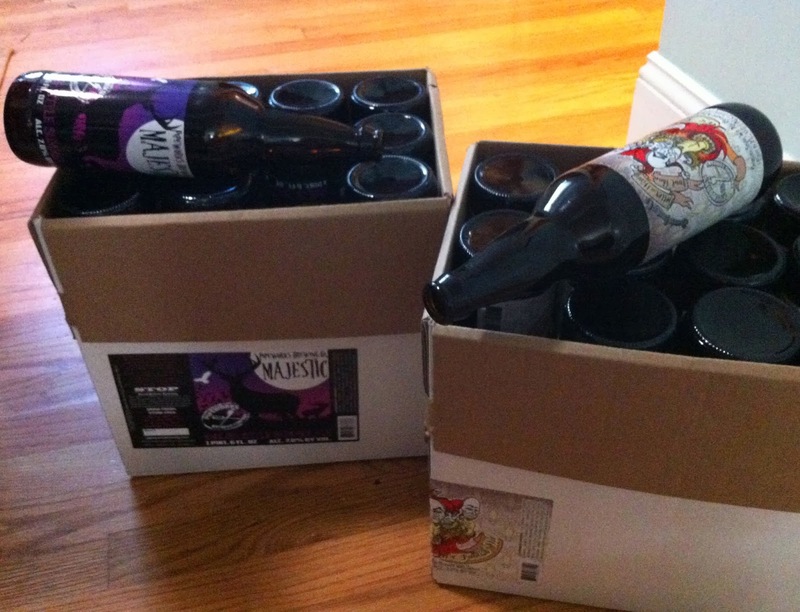 Thanks to Pipeworks, who donated 2 cases of unused labeled bombers to me! On a recent visit to their brewery, located on Western and North Ave., they said they had stacks of unusable bottles, because they were labeled prior to filling and then ended up not needing. I mentioned I was a home brewer and they offered to spare a few boxes. Thanks guys! If you haven't tried any beers from Pipeworks, you should checkout BeerMenus right now and find some. They brew some really interesting flavor combinations. Some of my favorites is their Chipotle Smoked Porter, Chai Dog, Raspberry Truffle Abduction, and Pastrami on Rye just to name a few. Sometimes the inspiration of a beer name comes from the recipe, like OH SO HOSSA, and sometimes the name of the beer just comes out of the process like... PUMPIN NUTS! I had set out a goal to make two pumpkin beers, a sweet and a savory. Sweet being "pecan pumpkin pie porter" and a savory being "Sweet-potato pumpkin curry ale." 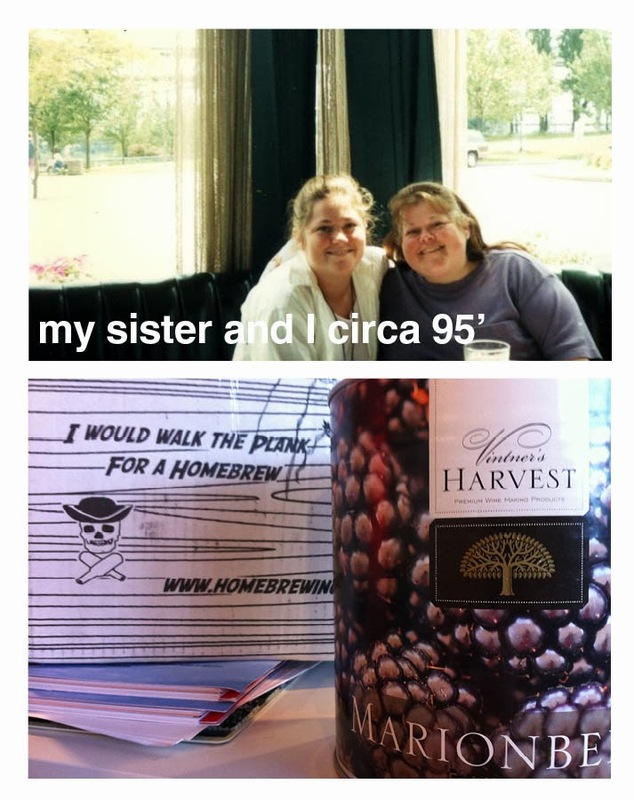 This is the story of my pecan pumpkin beer or what I like to refer to as... PUMPIN NUTS! A pumpkin pie with pecan crust topping that my sister made a few years ago. I wanted to see if I could translate this flavor combination into a brew. This is one of the first beers that I brewed where I completely broke away from kits (but still used extracts). Christian at Brewcamp, helped me formulate my recipe by suggesting which grains would go best with the beer style, which was awesome, but it was on the fly. I had originally wanted this beer to be a porter and it turned out more like a brown ale. I picked out grains like biscuit and caramel which flavor wise really complemented the beer, but it didn't give it the dark rich color that I had in my head. I loosely based the quantity of the ingredients off a generic pumpkin beer recipe that I had with me. I wouldn't suggest this. The beer still turned out good considering, but it wasn't the color or robust flavor profile I wanted, it was more subtle in taste and a lighter brown color, hence why I now call it a brown ale instead of a porter. Brewing with nuts... is nuts. Nuts produce oil. Oil is not good in your beer. I mean, who wants to drink an oily beer? Oil is also not a fermentable, meaning it doesn't contain sugars, so yeast won't eat it... and if yeast won't eat it, then it won't produce alcohol. Oil also fights head retention. So, if you choose to brew with nuts, against all recommendations from fellow brewers. You're going to have to extract the oil from the beer. I unfortunately did this using a gravy strainer and I literally pumped oil out of my brew for 3 hours... hence the name "Pumpin Nuts!" Next time I brew with nuts, I'll approach it a different way. I'll still puree the nuts, but roast them in the oven a few days before brewing to let the heat force the oil to the surface and then remove the oil to use for another purpose. Pecans don't produce as much oil as a peanut, but as soon as the pecan puree hit the brew the oil just started separating almost immediately and I began to panic. Another approach would be to just give it time and let the oil surface at the top of the bucket and then siphon it, which is probably what I should have done, and did do when I racked it, but this didn't occur to me at 2am after brewing for 6 hours on a Wednesday... my brain was not thinking properly. I also wasn't sure if this would trap the yeast and not allow them to have efficient air. I was doing everything I could think of to "save" this beer. An after thought on brewing with nuts is using a nut powder/dust rather than actual nuts. I have heard other brewers use this for the peanut, since that's an especially oily nut. I may also attempt this in the future as well, but as far as I know there is no powder for pecans. (2) pounds of pecans, I pureed the nuts in my Cuisinart. Final Brew notes: Subtle buttery nutty notes and slight creamy pumpkin tones make this ale smooth and light on your tongue. It's the kind of beer that isn't too sweet and you can pour yourself another. Appri Ever After, is my fifth home brew. It is an Apricot Belgian IPA. This beer was inspired by a play on words from "Happy" to... "Appri." I selected a Belgian IPA style to incorporate the apricot flavor, this was the first beer style I had brewed so I knew what to expect and I thought it would go best with an Apricot flavor, a bit sweet and tart with a bite. Just as I had brewed the raspberry and the marionberry beers, I used a puree specific for brewing with the Apricot. I think one of the hardest part about brewing is waiting, case in point, this beer took almost 8 weeks from brewing to tasting and I'm not a very patient person. Right after the second beer I started brewing more frequently so that I always have several going at one time in different stages I want to keep learning and move the process forward. This also happens to be my first beer that I brewed in a carboy. Prior to this batch I had been using 5 gallon buckets. 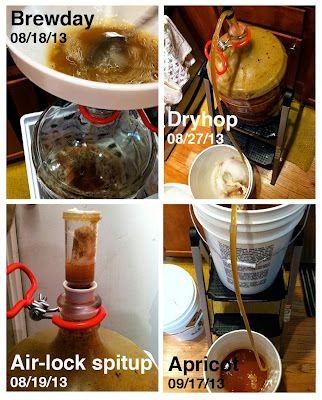 I was a bit intimidated to use the glass jug at first, it's heavy, breakable, and I thought it would be hard to clean, but after I got comfortable with the buckets I decided to give it a try and it worked great... accept the air lock system couldn't handle the carbonation from the yeast, because there wasn't enough space for air so it kept up-chucking into it. "I'm so sick of bottling little 12oz bottles! I only want to bottle bombers (22 oz bottles)." I said this at one of my home-brew club happy hours back in August and a friend replied, "Oh, did you just bottle your forth brew?" I replied, "Ha, yes. I just did!" Apparently it's common for those who quickly become avid home-brewers, to rid the little bottles by their forth brew. It seems agonizingly pointless to bottle 50 of these each week, it's so time consuming, takes up too much space, washing them over and over and removing labels seems daunting, and somehow you always end up sharing them with friends, so bombers just make way more sense. Other home-brewers also keg, but I have not gotten there yet. Also being a graphic designer by trade, I really love designing the labels almost as much as designing the beer. Ginger Aw-Snap! is my forth brew. It's an organic pink grapefruit-ginger Belgian Wit. I was inspired by a beer that I had back in May during Chicago Craft Beer week at Owen&Engine. 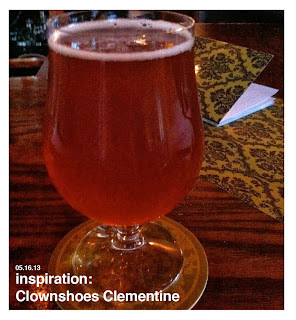 It was the most juicy citrus wit beer, I ever had, it was called Clementine by Clownshoes. I also love fresh ginger. I juice with it at home in various fruit and veggies combinations. I put ginger in drinks and dishes, it's so tasty and gives an extra fresh kick to your taste-buds. I knew I wanted to make a beer that was juicy sweet/tart citrus, but with spicy ginger twist. I love spice and interesting flavor combinations, so I was really excited about this brew. Fresh is best! I recommend using fresh produce when flavoring a beer, and organic if you can. I had bought dried grapefruit and ginger as backup, but luckily I never had to use it. Fresh is the way to go. The flavors just pop! I did two rounds of flavoring. First was at the kill of the boil and the second was a dry hop in the second fermentation. I wasn't initially loving the flavor after only using it in the brew, (it's OK, to taste your brew along the process, just remember to sanitize your utensils! ), so I knew I wanted to introduce the grapefruit and ginger a second time. When you introduce something foreign to your beer during a second fermentation, you want to make sure you sterilize whatever your introducing into the brew. I steeped the grapefruit and ginger peels in the muslin sack in hot water, to sterilize the contents, before introducing it into the fermentation bucket. 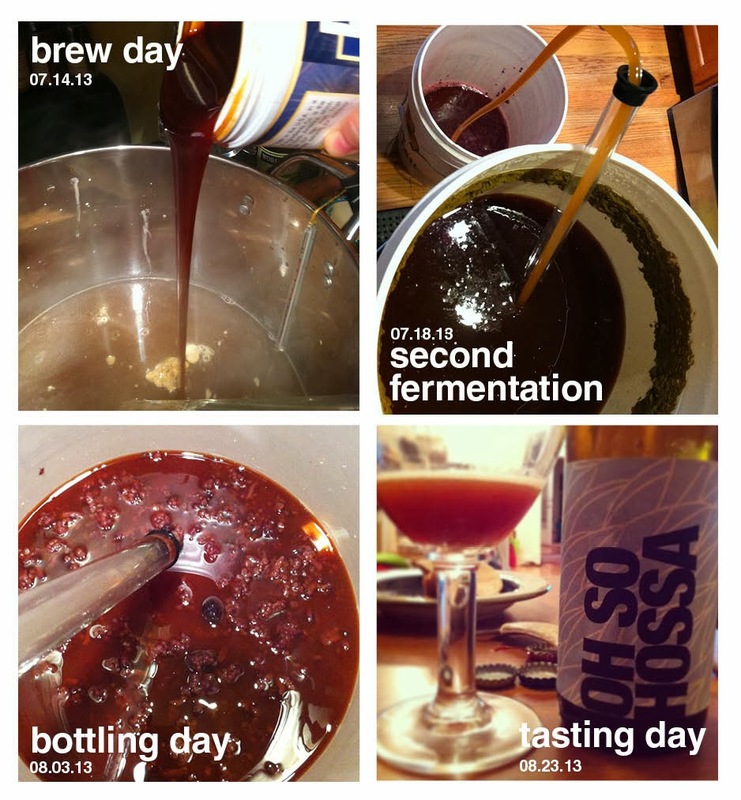 On bottling day: remember to stir your brew/beer as you are bottling after you add the priming sugar. Sugar tends to fall to the bottom of the bucket and if you don't stir the brew your bottles will have uneven sugar distributions. This is a problem because, the first two beers I went to open (which were the last two bottled) volcanically exploded, because they contained too much sugar. (4) Organic Pink Grapefruits (zest and surface peels only, no rinds they do not carry the flavor of the fruit and will bitter your beer) Use only 2 at the kill of the boil and another 2 in Second Fermentation. (2) large Organic Ginger Roots (approx. 10 oz total, sliced and peeled, after removing bark) Use only half at the kill of the boil and the remaining 5 oz. in Second Fermentation. This beer will bite you back. 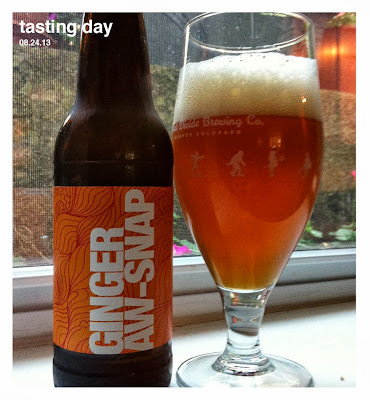 If you love ginger, then you'll love this beer. If your not a fan, then this isn't the brew for you, the snap will get ya. I would definitely make this beer again. It is so, crisp, juicy, and tingly from the ginger, just yum! Special thanks to my sister Mary, for helping zest the grapefruit and ginger for the second fermentation. She happened to be visiting me that day, so I put her to work! I first tasted this berry almost 20 years ago when visiting my sister, Theresa, who lived in Portland, OR. She was an amazingly creative, fun-loving woman who ignited a room with her smile and laugh. She had single-handedly introduced me to the art of wine tasting, craft beer pubs, organic foods, and taught me how to make homemade pesto, pasta... and if that wasn't enough, she also encouraged my creative talents. Wow. Needless to say her homemade pies were also off-the-chart. Her Marionberry pie, was so wicked good, that I wanted one every-time I came to visit... she had me hooked. Like all tasty things that I encounter, once I discover something new that I really love, I covet it and become immersed in it. If you're not familiar with marionberries, may I suggest that you get acquainted soon and treat your taste-buds to this remarkable berry. Marionberries, only grown in the Pacific Northwest, are best described as a hybrid between a raspberry and a blackberry. They are about the size, shape, and color of a blackberry, but sweeter and subtly tart like a raspberry, simply berry perfection. I couldn't wait to get this berry in a beer. So this leads me to my third homebrew... Paying homage to my amazing sister, while also giving nod to a favorite hockey player of mine, Marian Hossa... I set out to create a beer with his namesake and my beloved berry. My homebrew store, BrewCamp, carrys lots of different fruit purees, but didn't specifically sell this rare berry in their shop. Luckily I found an online store, Adventures in Homebrewing, which sold marionberry puree specifically for wine and beer making. Perfect. Now, I needed to decide what beer style was going to go best with this sweet, juicy, plump fruit, I also wanted to continue to explore Belgian style beers so I settled on a Belgian Tripel. It's rich depth of flavor would be a perfect paring to compliment this complex berry and triples "hat-tricks" are a bit of good luck in hockey too. I was warned by my friend Jesse, from Ale Syndicate not to do to many fruit beers cause they can really goo up your tanks/hose/equipment. I didn't really know what he had meant until this beer. The puree for this fruit was not as smooth as the raspberry, it had whole chunks and partial chucks of berries, and most likely was really meant for wine making rather than beer. Berry bits got stuck in the siphoning equipment, mucked it up, slowed it down, and added another layer of stickiness to the process. I brewed the Belgian Tripel as directed by the kit, but then introduced the marionberry puree in the second fermentation. It turned out pretty tasty and strong. And I must say I'm a fan of this Hossa too. Cheers! I've slightly neglected the blog only due to my busy brewing and work schedule the past couple of weeks, but fear not... More beer adventures are coming your way! 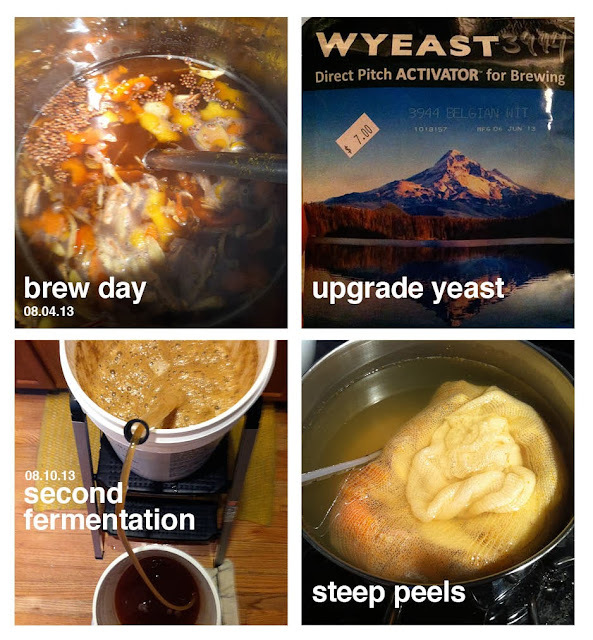 Most of my previous entries had followed a step-by-step process, because I really wanted to break down the steps to brewing and clearly illustrate the complete process. Now that you're in the know to some of the basic principles, the fun begins! Moving forward I want to shift gears and primarily focus on lessons learned, trouble shooting, new techniques, and beer history, reference and education. Brewing beer, regardless of the style or flavor you are trying to achieve really does follow the simple steps that I outlined in "3AM: Brew Day - Wednesday May 29" entry. Varying factors do come in, pending the specific style or flavor profile, which I want to share with you based on my experiences of lessons learned... And too bad there is no taste and/or smell-o-vision online yet! Cause damn! These beers are coming out so tasty! 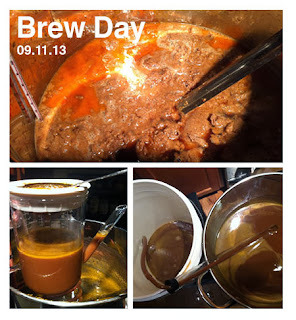 So far to date, I've brewed seven batches of beer and one hard cider... I've got some serious brews under my belt for a beginner... no literally, they are under my belt, which reminds me... I need to hit the outdoors and get back on my running routine. I'll be back with more beers and two new recipes I designed on my BeerSmith software, one of which I just entered in a home-brew competition. Exciting stuff, popping open over here. Cheers! So this is my raspberry Saison. Someone recently said I shouldn't have added raspberries to a Saison style, but Saisons have evolved since it's origin. Saison, which means "season" in French, dates back to the late 19th century of Southern Belgium. Where the beers were traditionally brewed in farmhouses in the late Autumn/Winter months and stored there until Summer to aid in hydration to the workers on hot Summer days. A typical profile of a Saison is usually based off a Pils malt, but with more dry character and is usually paired with herbs and spices giving it a complex and sometimes wild or funky taste. While candi sugar or honey is typically the sugar additive that lightens and sweetens the ale. I had interpreted all of these characteristics to go well with a berry, especially it being a Summer beverage. Based off my experience with baking pies from scratch, it's typical to incorporate spices, citrus, and herbs together with berries as you would in a cobbler or fruit pie. I thought this would be a refreshing berry Summer beer. It may have been a gamble, and not typical to what most would expect, but I do want to experiment with beer profiles and flavors and carry over my cooking and baking knowledge to beer. And I must say I'm delighted with how this second beer turned out. The color was a perfect reddish amber, it was a hint more on the tart side, giving nod to a wild ale, yet it remained crisp and refreshing. Also because it was not too sweet, you could easily pour yourself another, and another... but watch out at 7% ABV, it will make you tipsy. I would definitely make this tasty beer again. Yum. I was super excited to see the color of the beer color shifted from a golden amber to a raspberry red, yay! Before bottling day remember to prep your bottles the day before, so that your bottles will be clean and ready to get filled with your beer right away. - If you have access to a dishwasher, load it up and let drip dry or hit the sanitize cycle. - Measure and record your beer for the ABV with the Hydrometer. This is the final calculation in determining the percentage of alcohol in your beer. - Add the room temperature priming sugar to the bottling bucket with spigot. 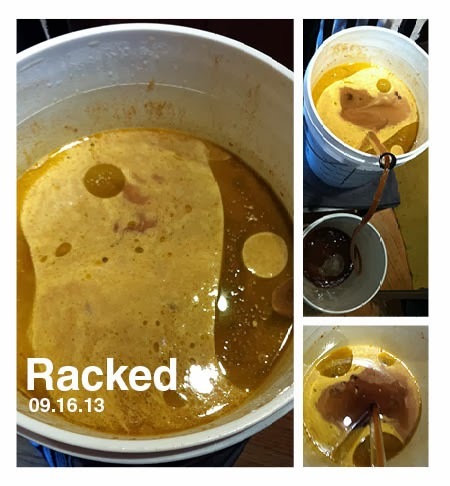 - Rack your beer from the second fermentation bucket into the bottling bucket. - Hookup your tube from your spigot to your bottling filler so you can fill your bottles with beer. - Cap the bottles and store in dark place around 64-72 Fahrenheit. - Wait 2 weeks for bottles to become fully carbonated and tasty. For the Raspberry Saison, I added the puree to the secondary fermentation after racking, moving beer from one bucket to another. This batch was much easier to handle because I knew what to expect (good to see the yeast poop ring! ), but there are a couple of things to note. Since you're introducing a new element into your brew, you need to do some prep work to minimize any contaminates. This might sound like overkill and your right. You want to kill any possible bacteria that might ruin the flavors of your beer. By taking this extra step you're less likely to allow any possible contaminates that might be on the can or the opener that could possibly leak into your fruit or your brew and either kill your yeast or create another form of unwanted funk. - I opened the sanitized cans and I poured their contents into the clean sanitized bucket. 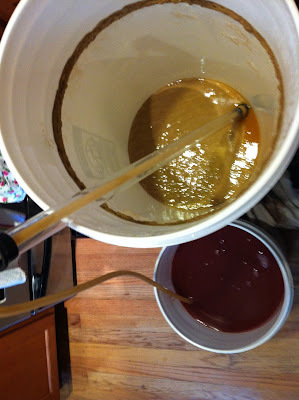 - Then I racked the beer from the primary bucket into the secondary. - Closed the lid and wait another 2 weeks. I read online that Dry Hopping is usually only one extra week but fruits are usually two weeks in the secondary. It didn't take me long to start my next beer, in fact I started it a few days before tasting the first! I selected a Belgian Saison Brewer's Best Kit and decided to was going to go a bit off the grid and start tweaking the recipes slightly. I am still trying to get a handle on the brewing process, so I thought continuing with the kits and putting my personal twist on them was the best route until I was comfortable to breakaway from kits in general. This beer was going to get 6 pounds of raspberries puree added to a 5 gallon batch. I couldn't wait to taste it, even before the water started to steep the grains. I wasn't my initial intention to make a fruit beer, but it is Summer and it sounded refreshing and super tasty. I didn't know when exactly to add the fruit in the process, so I went online to do some research and discovered that most fruit is added in a second fermentation process. There are also different ways to approach adding a fruit flavor. You can add real fruit or you can add a chemical extract of the fruit. I personally have always been a fan of the real thing, I try to eat organics and I passionately against GMO's. 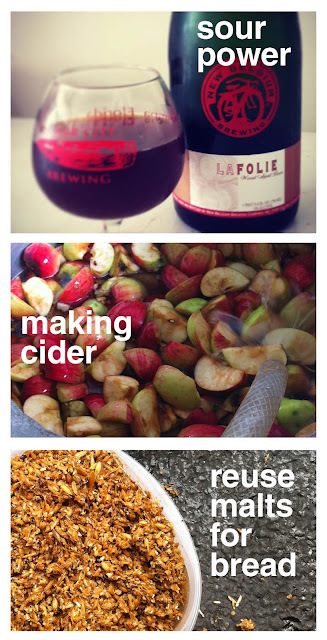 I plan on making all my beers with real ingredients real fruits, spices, meats, and sweets. (Yup, I said meats... a bacon beer is in the recipe hopper). FRUIT BEERS: A general rule of thumb is that if you want a incredibly fruity beer, you need to do a 2/1 ratio. That being 2 pounds of fruit to 1 gallon of beer. With my recipe I was only going to use 1.2 pounds of raspberries per gallon. Adding fruit can be expensive and I wasn't even sure how this would turn out, so I decided this was enough to get started. I also decided not to attempt buying fresh raspberries from the grocery store and just preparing them myself, however in the future when I become more adventurous and comfortable with the process, I may take this route. For this batch however I used Vintner's Harvest Raspberry Puree, which is GMO free and made specifically for home brewing and wine making. It's already pureed and sold in a 3 lb can ready to go when you need it. OK, so let's get started! Saison Kit with ingredients listed in order of adding to pot or bucket. Another thing that I started doing after the first batch is going through all the ingredients that your using and then numbering them. I don't like to scramble, re-read things or try to find an item in a flurry, especially when you have a time and temperature sensitive process. It's so easy when you're just looking for the item labeled 3 rather than German Hallertau hops packet. Like I said there is an vocabulary shift with brewing, I'm still learning all the names of things, this helps me become familiar, remember the step in the process, and streamlines efficiencies. The brew day process is very similar to my second post so I won't reiterate that, but some of the ingredients change pending the kind of beer your making. I was told that you should wait two weeks before drinking your home brew. I lasted 11 days before I popped open the first bottle. I couldn't believe my eyes, hears, and tastebuds! It looked like beer, sounded like beer, and even tasted like a yummy beer! It had the right profile of a Belgian IPA, strong flavor and high alcohol content with an ABV of 6%. The complex flavors of piney, herbal and citrus came through in the aroma, taste and finish. It was spot on with the exception of a little too much carbonation. My friend Jesse, from Ale Syndicate, pointed out that the extra bubbles were probably caused by adding a bit too much priming sugar on bottling day. I was in pure amazement. I had created this tasty alcoholic beverage and the beer bug soon took over... I began plotting my next beers, cultivating my laundry list of recipes and flavor profiles. So we are finally ready to bottle! Yay! But wait, before you can start filling 50 little bottles full of all your hard labor, your going to need 50 little bottles... On average a 5 gallon batch fills about 50, 12oz bottles, or about 25, 22oz bottles (bombers). As days neared my scheduled bottling day, I had collected only about 20, 12oz bottles. I started to get frantic and texted some friends to see if anyone had extra in their recycling bin. Luckily I scored big with my friend Brad from BeerRunners who had about a dozen, another co-worker brought in a few empties to the office, and some of my kind neighbors left bottles at my doorstep. All in all, I had about 45 collected, so that would mean I'd also need to prepare some of my growlers as back up too, luckily I had 3 of those. On average a growler holds about 5 beers, 64oz. Of course I could have bought all clean, shinny, new bottles at BrewCamp, but where is the fun in that? No hard labor, no hours spent scrubbing and soaking bottles in water or GooGone (sold at DollarTree!). That would be just too easy. Plus I couldn't rationalize paying for empty bottles, I mean... they're empty. A couple of days before bottling day there needs to be some prep-work and that starts with: scrubbing, cleaning, and sanitizing your bottles. There are definitely some bottles that work and some that don't, here's a list of what I've come across. New Glarus & Dogfish Head Their paper labels slip right off after soaking in some water and require minimal scrubbing, they also have the classic bottle shape. They don't have the secure air-locking system on the cap. Nothing is worse then scrubbing a bottle for about 20 mins and then realizing it's a twist-off... another Leignkugle sneaked it's way in! The glue on the bottles is almost impossible to remove, it repels water and GooGone (see photo on left). They have a different bottle shape, neck, and a shorter top near the lip. The clamping system on the capper device can't lock/secure the cap at the shorter height (see photo on left). They use water resistant sticker labels rather than good old fashioned glue and paper, which requires more work to remove. OK, now you have naked bottles, the labels have been removed and they've been scrubbed. Now they need to be sanitized and sterilized. Use a StarSan water solution in one of your buckets and completely submerge each bottle to sanitize. Then if you have a dishwasher you can load the washer with all the bottles and set the machine to sanitize to blast it with super hot water to kill any bacteria, this should sterilize your bottles. Do Not put any dishwasher soap into the machine. You don't want those chemicals leaving residue on your bottles and contaminating your beer. If you want to use anything you can use a tiny bit of StarSan, it goes a long way. If you don't have a dishwasher, you can let the bottles air-dry. 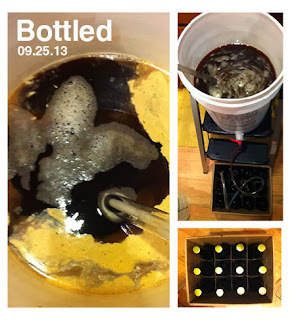 Most home-brew shops have a bottle tree you can buy that will help let the liquid drain and speed up the drying process. I used a dishwasher and panicked after I found out some of my bottles had condensation in them after the machine had ran through its cycle. 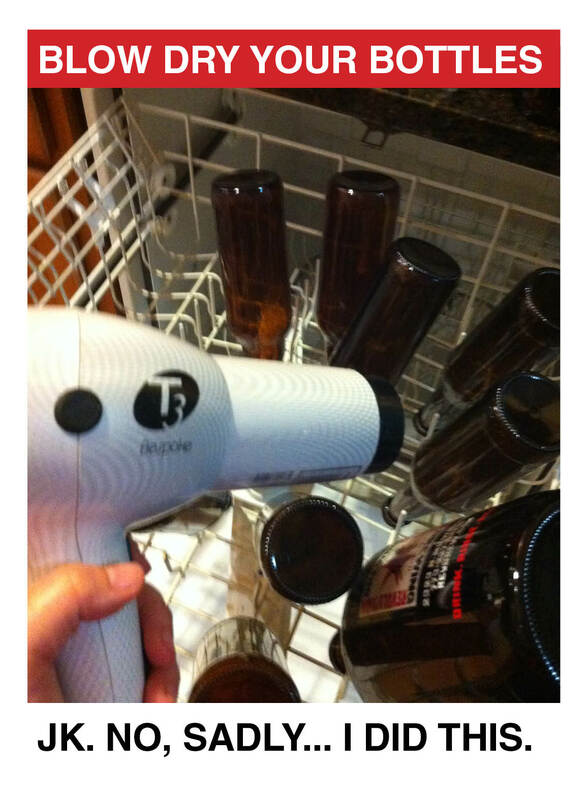 I wasn't sure if the moisture would contaminate the beer so I tried blow-drying a few of the bottles before use. No, for real, I did this... (see photo on left). I'm sure in hindsight, this was overkill, but I was super cautious with my first batch. Moving forward I'd suggest running the dishwasher the day before so that the bottles are fully dry and room temperature. Remember yeast are very temperature sensitive, you don't want to fill hot bottles with your beer and kill the yeast. OK, now bottles are ready, let's prepare the beer to be transferred to the bottles! Step 1: Measure and Remove. Use your hydrometer to take the last measurement for the ABV calculation, record it and determine the alcohol content for your beer. With a sanitized utensil, remove any second fermentation additives, you may have used. Step 2: Rack your beer. Move your beer, using your siphoning tool, from your fermentation bucket to a bottling bucket with spigot. Remember to leave the yeast poop in the fermentation bucket, you don't want that in your beer. Step 3: Add priming sugar. Boil water and the priming sugar until completely dissolved. Before adding the solution, make sure to bring the temperature back down so you don't scald the yeast. Step 4: Prepare and transfer. Gather all your bottles so they are ready to be filled. Attach one end of your tube to your spigot and the other end to your siphoning bottling filler. This will allow your beer to flow from the bucket into your bottle. It streams beer through the tube and only allows beer to flow out once the spring tip is compressed, at the base of your bottle. You'll want to leave 1 inch of air space at the top of the neck to allow the yeast to create some carbonation. A good measure for this is filling your beer to the capping line and then removing the bottle filler. Once the device is removed the liquid usually drops about an inch from the top. Step 5: Seal bottles with the bottle capper. This might be my favorite new tool, I love capping! It's super easy to use just place an unused cap on the bottle and bring down the clamp with both of your hands... Bam! You just made a beer! Step 6: Store in a dark place around 64-72 Fahrenheit. So I told you I had picked a beer that was intermediate level, that's because IPAs usually involve a thing called "Dry Hopping." Dry Hopping is when you add extra hops to your beer "dry" after it's already fermented in the bucket for 4-6 days. During this time air should already be releasing from the airlock system. The air-lock system has a valve to fill half way with a liquid, some home brewers use water but I was told in my brew class by BrewCamp "Why fill it with water, when you can fill it with vodka?" Love this idea. This way if bubbles release and any fluid from the air lock system into the bucket by accident, it will be dropping in vodka rather than water which could, contaminate your brew. So once you open the bucket to dry hop, there are a few things to note. Step 1: You want to see a grimy, gooey, crusty ring at the top of you liquid line. This is waste created by the yeast doing their work. They are eating the sugars in your brew and leaving what I like to refer as "yeast poop," it's stuff you don't need, a bi-product that comes from yeast eating sugar. The stuff you do want from the yeast are the bubbles and the alcohol, everything else will get removed through racking. Step 2: Measure your alcohol levels in your brew with your hydrometer and record it. A hydrometer, is the device that measures the buoyancy of your liquid and determines the amount of alcohol through a calculation formula. See the page marked "Brewing Terms" for more information on this. Step 3: Rack your beer. Transfer the beer using a siphoning tool. Moving the beer from the gooey, crusty bucket into a clean sanitized bucket. Yeast don't like lots of air, so don't just dump the beer from one container to another, you'll generate too much oxygen in the process. Siphoning allows the beer to be transferred by sucking it out like a straw and moving it from one bucket to another using gravity as it's force. It also allows you to monitor the transfer and leave the gooey bits and yeast poop in the dirty bucket. The bottom of your bucket should have about an inch or two or murky putty, gooey crud (more yeast poop). Once you see it and there is no more good, clearer liquid stop the siphoning. All of that goop should stay in the dirty bucket and not be transferred to the second clean bucket. 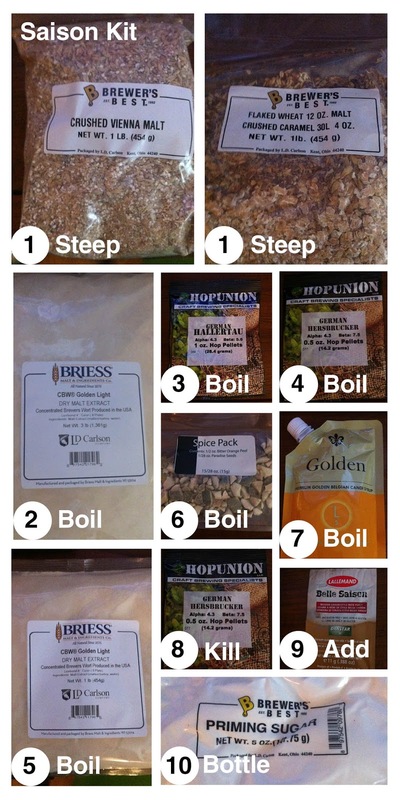 Step 4: Add your dry hops. Hops should be placed in a muslin cloth sack tired loosely at the end, then dropped into the bucket. Close lid and wait for the yeast to feed on the new food you gave them. The extra hops will also add extra flavor and kick to the beer. This is that extra bitter hoppy smell you get from an IPA, that aroma and bite, is from lots of extra hops. 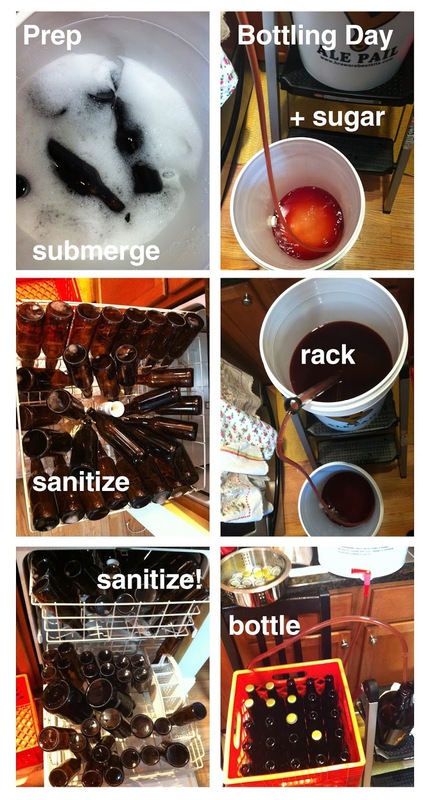 You should keep the beer in the second fermentator for at least a week, before preparing your beer for bottling. OK, so this is a learning process, and one thing I can tell you for sure is don't start brewing at 11:00pm after watching a Blackhawks playoff game. Sure, your adrenaline is going, you're pumped... You just drank a few beers, you saw your team go into overtime and win it, your friend says she'll come over and help, it will be fun! Umm.. then fast forward 4 hours later when you're finally done washing the last bucket and climb into bed... at 3AM. So this is the story of my first homebrew. I started with a Belgian IPA brew kit, from Brewer's Best, one of the largest and most trusted home brew companies, purchased at Brew Camp, my local home brew store. I love Belgian styles so I figured this is where I would start, I just sort of picked one that I knew I'd like to drink and had a strong familiarity on how it should taste. It happened to be a rated intermediate for level of difficulty, this I didn't know until I started on Brew day, but hey, I'm a pro in the kitchen. I've made at least a half dozen successful Thanksgiving/Christmas turkeys and festive feasts, surely I could master following some instructions. The first hurdle, was just getting to know the ingredients and recipe language. It's not like a Epicurious recipe that makes sense to the average kitchen guru. There's language like, racking, siphoning, steeping (OK, so this one is easy because you do this with tea), and then the ingredients are called things like... DME (Dried Malt Extract) or LME (Liquid Malt Extract), and then we probably need to go into explaining what malts are... it's endless. I decided just now I'll need to include a glossary of terms on a separate page for this blog. I'm going to break it down as simply as I can for a brew day. Wort is simply a tea which is created when you steep grains. 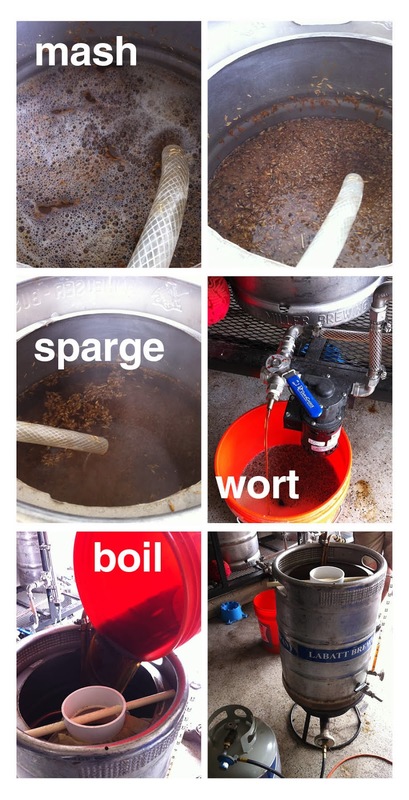 There are different ways to make your wort. You can use extracts, usually provided in a kit, which is what I used and then there is "All Grain" we'll discuss "All Grain" further down the road, since that process is more complex, but simply put, Extract is like getting your coffee ground and ready for you to brew as opposed to an all grain which is like buying the coffee beans and grinding them yourself, it takes an extra step when using "All Grains"
Step 4: Boil your wort and other ingredients that give your beer it's unique profile. Adding them as you would in order of importance and ending with the most delicate aromatic ingredients last. Just as you would, if you cooked a meal, you'd start with the main focus, such as a protein, prepare the vegetables then ending with seasoning, herbs and accent flavors. It's the same with beer, and the last ingredient you add to your brew's boil is usually the first thing you smell when your sniff your beer. Step 5: Kill the boil. Once all of your ingredients are in the pot you need to stop cooking them and bring the water temp down to 70 degrees Fahrenheit to preserve all the flavors. This parallel's again with cooking. Once you're done cooking your protein, vegetables and herbs, you want to stop cooking, before you ruin all the flavors, overcook or burn them. You need to bring your brew down to 70 degrees as quickly as possible. 1) Place your pot of boiling wort in a sink filled with ice. You're going to need a lot of ice and patience, this option takes the most time. Also do not put ice directly in the pot, because it could contaminate your brew. 2) Use a purified wort chiller. A wort chiller is a handy device that speeds up the cooling process. It's a copper coil that hooks up to a garden like hose nozzle and feeds cold water through it without letting water actually touch your brew. This is the fastest way to cool your wort and it still takes about 45 mins to bring the temp from 210 down to 70 degrees Fahrenheit. Step 6: Rack (strain) your beer to remove excess ingredients as you transfer the liquid from the pot to the fermentation bucket. You'll want the clearest liquid possible for drinking, so it's necessary to remove everything that can't be strained. Step 7: Add enough purified water to bring your bucket to 5 gallons and calculate your ABV (Alcohol By Volume) with a device that measures the buoyancy of your brew. This is the first part in the calculation of your beer's ABV. You'll take another reading on bottling day, so the first reading is just the first part of the calculation in the formula. Step 8: Add yeast and secure lid on bucket. Step 9: Let the yeast do it's work. Go to bed and wait 4-6 days, for next phase of brewing. Phew... that only took 4 hours! Several weeks ago I took an introductory class to home brewing at my local home brewing shop Brew Camp A one hour crash course into making your very own beer. I was as giddy as a kid in a candy shop. I have always loved drinking beer and have been an avid cook in the kitchen, so this seemed like a perfect marriage for me. I sat in the front row, took notes, asked questions and kept my ears open and if there is one word repeated more than beer in that class it was sanitize... sanitize... sanitize. And that your beer is only as good as your water, since after all water is the main ingredient of beer. Chicago water, I learned, naturally has chlorine in it, which is not a friend of beer flavor, so first step is to extract/neutralize and remove the chlorine. 2) neutralize: fill a bucket with 5 gallons of water and add a crushed Campden tablet then let sit overnight. Nancy holds a BFA in Graphic Design from University of Illinois. Being an artist by nature, she loves creating new things. After being a self taught home cook for many years, her love for creating things from scratch, transpired into becoming a brewer. After studying classic styles she then took the written and tasting exam to become a Recognized BJCP Beer Judge. In 2016 she helped launch the Chicago Brewseum and is on the auxiliary board. Most recently she has been hired on along with other brewers to brew craft beer at ALULU Brew Pubs in the Pilsen neighborhood of Chicago. All photography and writing on this site is copyrighted by Nancy. . Simple theme. Powered by Blogger.